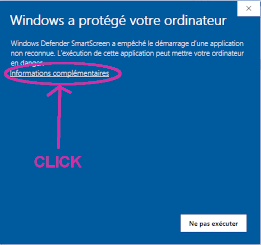 If you get a Windows Defender warning while installing Arcade Fitness, you need to click on "More Info" and then authorize the execution of the installer. Which sensor can I use with Arcade Fitness ? 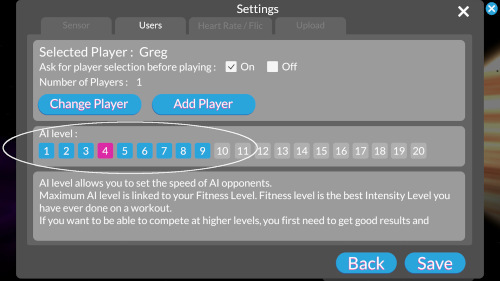 Using a sensor is a mandatory to make your character move in Arcade Fitness. There are different options with different kinds of sensors. 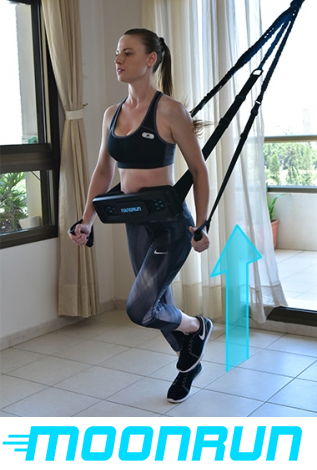 See the list of compatible sensor types or the list of comatible trainers / stationary bikes. What is the Moonrun ? How to use ANT+ devices on Android ? If you want to use ANT+ devices, your smartphone needs to be ANT+ compatible, see the list of native ANT+ compatible phone on ANT+ directory. If your phone is not native compatible, it has to be OTG ready (On The Go, most smartphones are compatible today), and you will have to buy an additionnal ANT+ comptaibility stick with an USB-OTG cable. How to use Garmin watch ? Get speed and heart rate from your Garmin watch and send it to your phone with the Arcade Running Transmitter watch app. Get more info on Garmin watch and how to use it as a gamepad to play video game. How to use Xiaomi MI bands ? 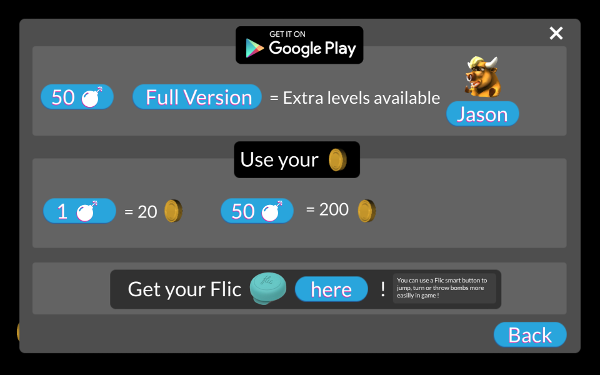 How to choose player and level ? Select your player, in the list of available players. See complete players descriptions to know about strength and weakness of each one. If one of the players is locked, it meens that you have to complete an achievment to be able to use it. Track : you don't have to care about jumping and other actions on this level, just run the fastest you can ! Steeple : here you have to jump sometimes but it will be easy since the road is completely flat and there is no hole. 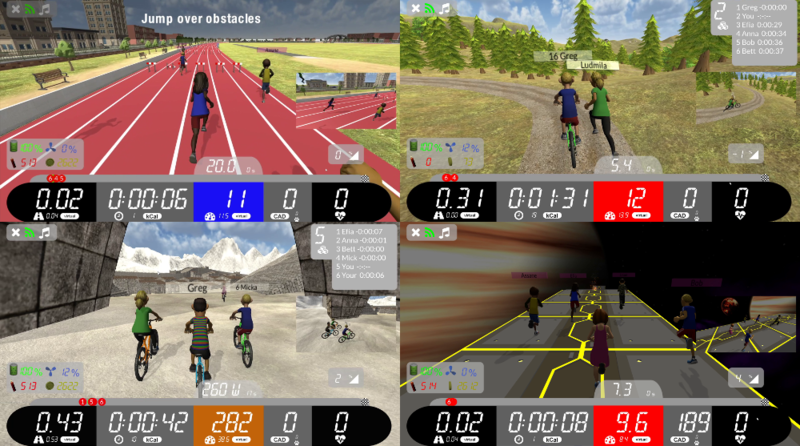 Choose your distance between 100m and a marathon ! How to perform in game actions ? Having the option to perform actions within the game will really improve your fitness experience and make time fly faster. In order to perform these actions, just tap on the screen of your smartphone or tablet. If you jump twice in a row, you make a double jump and you will be able to pass over higher obstacles. 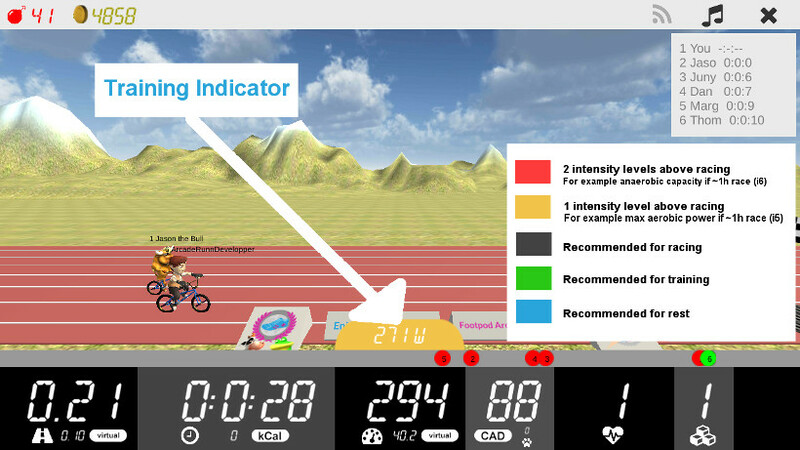 Get the best virtual reality running or cycling experience using a Flic button during your workout... Connect it by first clicking on the search button. Then, you will see all available smart-buttons and you will be able to click on the one you want. In order to complete the pairing process, you need to push the button once and it will be picked up in the app. Finally, you get a message that a button has been grabbed! In order to be more comfortable while using the Flic button during your workout, you can buy a Flic button holder. The Moonrun system allows you to perform in game action without additional devices. Simply jump for real to jump in the game, turn left or right to make U-turn or squat to attack your opponents with a bomb. 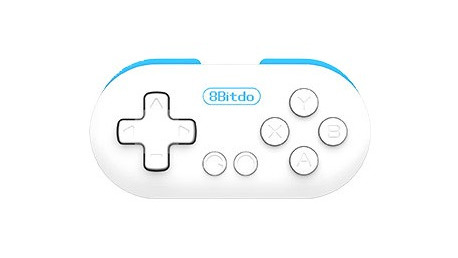 How to use 8Bitdo Zero gamepad ? First, press the start button to power on the 8Bitdo gamepad (for both Android and Windows). If the LED blinks rapidly, this means that it has already been paired and it tries to connect to the paired device. When the connection is established the LED light on the bottom of the gamepad stays on. If you want to pair the gamepad to antoher device, you need to cancel the previous connection. Just hold Select (left middle button) for more than 2 seconds. In this case, or if the gamepad has not been paired before, the LED light blinks about once per second. This means that the 8Bitdo is in pairing mode. Scan for Bluetooth devices on your main device (Windows or Android, the gamepad is considered as an input device) and select the 8bitdo Zero gamepad to add it to paired devices. The LED light should stay always on after this this operation as it is connected. Be sure sure that the 8bitdo Zero battery is fully charged to be sure to detect it while pairing. How to have bombs ? Use the coins you collected while playing to buy additionnal items like bombs or buy a 50 bombs pack with real money. Click on the Shop button in Arcade Fitness Main Menu to be able to do so. How to use training workouts ? Test our training indicator. This is a speed or power recommendation which is specific to the distance and workout (i.e. intensity level) you choose... It will make you do your best effort or just help you train with intervals. You just have to go to "Settings Menu", then enter your FTP or average best 1h running speed in km/h in the Sensor tab. 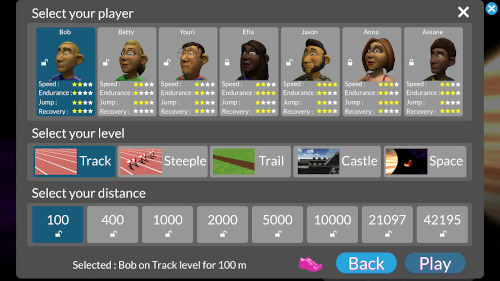 Finally, be sure that the option is activated and you will be asked to choose a workout before you start playing. What is Fitness Level ? 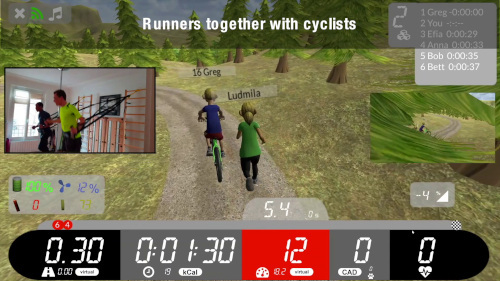 Fitness Level is an indicator for both running and cycling which shows how fit you are. It ranges from 0 to 20. We build a relathionship between power and running speed. Each time you do a workout, your average power for 1 hour is estimated (FTP) with what people do in average on the distance you choose compared to what they do on a 1h workout (for example, people in average are able to hold 2.7 FTP for 15s, which is the 100m running or 300m cycling level). Then the power for 1h estimation is converted into equivalent running speed. This means that someone who has a Fitness Level at 11 should theoretically be able to run 1km/h faster than you on 1h workout if you are for example 10. How to set AI opponents speed ? You can choose opponents speed in the Settings Menu, Users tab. AI speed should be inferior or equal to your Fitness Level. How to get Windows version ? How to use a Bluetooth Low Energy device on Windows ? Bluetooth Low Energy on Windows requires an additionnal BLED112 USB stick even if your computer is natively compatible with Bluetooth Low Energy. You need to install the driver corresponding to the BLED112 before launching the game and pluging in the stick. Do I need an internet connection to play Arcade Fitness ? Internet connection is not mandatory on Android if you use the "Play Offline" feature. This is not the case with the Windows version where you need to connect with your account to be able to play... Of course, best scores or Strava uploads as well as online multiplayer races require access to internet. Is Arcade Fitness compatible with iOS ? Arcade Fitness is not compatible with iOS yet but we plan to work on this in the future. You can subcribe to our Facebook page if you want to keep beeing informed about it.